Reserve Amazing Majestic Oaks Today! Our stay was still good despite the steady and a few hiccups. When we're arrived friday night the parking area bulbs were out, we're had no propane, and the hot tub had apparently blown a relay. Guest services fixed the first two right away and we were told the hot tub would be fixed by the morning when lowes opened. Needless to say we never got to use the hot tub. It rained all weekend and the roof had a few leaks. And the kitchen needs more pots instead of just one to accommodate cooking for 11 guests. Other than that we loved the stay and location. House was spacious with plentyof sleeping. We had a great stay but were a little disappointed in the amenities and comfort. All but 1 of the pool sticks were broken on the tip. And the hot tub was really low on water which wasn’t a big deal we just added more. The couch in the family room was horrible. You sat on it and went straight to the floor. The rooms were nice and beds were comfortable. The location of the cabin was perfect, and easily accessible. Parking is tight. The cabin itself was nicely laid out, it is an older cabin and the furniture on the main floor could definitely be replaced, you really could not even sit on the couch. We did not have to use the pull out so I don't know if the pull out bed was as worn. It is nice having the yard if you have pets, that along with the large porches and decks gave gave them plenty of places to roam. The walls are extremely thin, so if you happen to have early risers or late nighters they will be heard thru out the cabin. We have stayed in this cabin before and find that it has really needs to have some improvement on the furniture and kitchen supplies. We really like the location of this cabin. We loved the property and Cabins USA. It was a great cabin and we loved the hot tub & pool table. Having a bathroom on every floor was so handy. When we had a couple of things go wrong they came out the day I called and fixed everything! The seclusion of the cabin, but still super close to town was perfect for the 9 of us! The cabin is older and seems smaller than it appears in the photos. Deck lumber is worn, older carpet inside, our bed mattress had a dip in it, but was soft. . . minor details that come with "cabin expectations," I suppose. We cooked meals there, but could not find hot pads or trivets. Pans were older. My wife thought it would have been nice if they had swept the deck, cleaned some chairs (wish we could have found a broom). . . Hot tub was clean and heated. Clean towels and sheets. Clean bathrooms. Clean kitchen. Generally in good condition, even with age. All in all, the cabin was a wonderful place for us and our extended family ( 8 altogether) to stay. 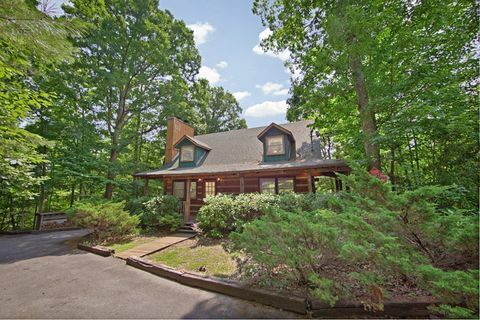 It was quiet and conveniently located in a beautiful wooded setting. Personnel always followed up on requested service. Our grandchildren enjoyed the pool -- a good size and well maintained. We enjoyed our stay. This cabin is very spacious. We had a gob of towels n bath rags, which was great.The steps were kinda narrow. Our last night the heat messed up n we froze. Lol. Other than that we really enjoyed ourselves.. We were very close to all the stores. Please leave a guest book n the cabin. This location could use some upgrades and attention. But truly enjoyed our vacation as a family for Christmas. The cabin was nice, but the decor was a little rustic and outdated other than that it was great and I would definitely stay there again. cabin was clean and had everything we needed. great location from the parkway. will come back again. Only thing we see need to be is blinds over windows in front, and blinds over bottom level doors. The stay was perfect. Any questions or issues that arose, a simple phone call and management had it answered immediately. We enjoyed our stay very much. The cabin was a bit more rustic than what the photos on the website showed, however, was well maintained and clean. There was plenty of room for my family. Thank you for taking the time to let us know about your recent stay in Amazing Majestic Oaks! We here at Cabins USA strive to give each of our guests the best stay possible while vacationing in the Smokies. Thank you for choosing Cabins USA and we look forward to having you as our guest again soon! This was a perfect location, not the fanciest but was really nice for the price and it was the last cabin on that road and a little private. Thank you for all of your kind words! We here at Cabins USA strive to give each guest the best stay possible while vacationing in the Smokies. When you are ready to stay with us again, please mention you are a return guest for an additional discount. Thank you for choosing Cabins USA and we look forward to having you as our guests again! This cabin was absolutely amazing! It was huge and had a full bathroom on all 3 floors! The king bed slept great, but the queens needed a topper similar to the king bed, that's the reason I gave comfort a 9. Everything was amazing. I didn't find the pans until the very last day, they were in the island and I was looking by the stove, but there were a ton of pans to cook with. The location was literally in the woods but still just a few minutes from the main strip. This was also one of the few cabins that wasn't right beside other ones. I was very impressed! Thank you!!! Thank you for all of your kind words! We here at Cabins USA work hard to make sure each of our guests have the best stay possible while vacationing in the Smokies. Thank you for letting us know about the queen beds. Your comments have been forwarded to our Owner Liaisons and they will be bringing this to the owner's attention. When you are ready to stay with us again, please mention you are a return guest for an extra discount. Thank you again for your review and thank you for choosing Cabins USA! This is a pet friendly place - that being said carpet floors not a good idea. It wasn't as clean or the freshness we expected. Was not as secluded as the pictures showed. Pool sticks worthless but maintenance did try to fix and left us one new stick which is all we used the whole week. Menu on two TV's never worked (only way to know the show was to switch to that channel). A suggestion also would be less remotes and maybe some direction with remotes (which some never worked). I'm in IT and was not going to spend my vacation troubleshooting cable TV, etc. Roof leaked and soaked a pocket book. If you're looking for quiet in a different part of the house while others slept or talked, no such thing, could hear everything between 2nd and 3rd floor. Dining room floor was not even level. I would not let a child lean on the balcony railings, nails popping out of the decking and the floor downstairs by the sliding glass door was a hazard. Things really need to be addressed before renting again. I have rented from Cabins USA before and most have been spoiled but this may be my last time because of the accommodations. Overall very nice cabin. Loved the express check in/ check out. Had an issue with oven and the staff called back immediately and offered to move us to a new cabin. Very impressed with with the staff and how friendly they are. This cabin was in a very nice location. There was plenty of room for everyone. I am so happy to hear that you enjoyed your stay in Amazing Majestic Oaks! We here at Cabins USA work hard to ensure each of our guests have the best stay possible while vacationing in the Smokies. When you are ready to stay with us again, please mention you are a return guest for an additional discount. Thank you again for your review and thank you for choosing Cabins USA! Overall was satisfied with my entire stay. Couldn't get everyone comfortable with one temp . Hot upstairs , warm downstairs, main floor had a lot of cold air around doors coming in .. hot tub exterior is bad shape but hot tub worked great .. great location, private .. cabins USA staff was great .. would use then again, may chose another cabin .. wasn't disappointed though .. good value for the price .. Thank you for taking the time to let us know about your recent stay in Amazing Majestic Oaks! We here at Cabins USA work hard to make sure each of our guests have the same great stay you enjoyed while vacationing in the Smokies. I apologize for the issues you experienced with the cabin temperature. Your comments have been forwarded to our maintenance department to be addressed. When you are ready to stay with us again, please mention you are a return guest for an additional discount. Thank you again for your review and thank you for choosing Cabins USA! We thoroughly enjoyed our stay. Due to having a 14 month old grand-daughter we wish there was a door on the stairs going down from the kitchen. I am so happy to hear that you enjoyed your stay in Amazing Majestic Oaks! We here at Cabins USA work hard to make sure each of our guests have the same great stay you enjoyed while vacationing in the Smokies. When you are ready to stay with us again, please mention you are a return guest for an additional discount. Thank you again for your review and thank you for choosing Cabins USA! we were here during the fires and the owner called us, to make sure we were ok. the place was great no problems. we had a great time. I am so happy to hear that you enjoyed your stay in Amazing Majestic Oaks! We here at Cabins USA work hard to make sure each of our guests have the best stay possible while vacationing in the Smokies. When you are ready to stay with us again, please mention you are a return guest for an additional discount. Thank you for choosing Cabins USA and we look forward to having you as our guest again! Dryer did not work. Would not heat up and made a noise. Except for the roaches and a few cobwebs the place was clean. Needs cleaning good . Has live bugs and a lot of dead bugs. Dryer needs something it has a very squeaky wheel.The location is great. The bunk bed mattress were not great. Our stay was fabulous. We even had a bear visit several times--don't think he will be there very long though. The authorities were checking on him--he was raiding the trash cans in the area every night. We have used several of the rental companies in TN and NC and yours was by far the easiest to navigate-everything from reservations to check-out was so easy and very professional. Thank you. I am so happy to hear that you enjoyed your stay in Amazing Majestic Oaks and were even able to see some of local wildlife! We here at Cabins USA work hard to make sure each of our guests have the best stay possible while vacationing in the Smokies. When you are ready to stay with us again, please mention you are a return guest for an additional discount. Thank you again for your review and thank you for choosing Cabins USA! We loved the cabin. We will rent it again. Express check in is great. I am so happy to hear that you enjoyed your stay in Amazing Majestic Oaks! When you are ready to stay with us again, please mention you are a return guest for an additional discount. Thank you for choosing Cabins USA and we look forward to having you as our guest again! We did enjoy our stay. The cabin needs to be updated . Please check the toaster it was sparking afraid it might start a fire . And not enough chlorine in the hot tub. Don't mean to complain we had a great time. But it really needs some updating. The cabin is a very nice cabin with lots of room. The washer/dryer, dishwasher, stove, refrigerator, and BBQ grill all worked great and was very much appreciated. However we were greatly disappointed when we discovered the coffee pot was found to be broken with a hole in the pot. Hard to make coffee on the stove but we managed. We were also disappointed in utensils, bowls, and other kitchen dishes. It seemed to be adequate for a small amount of people but not for large groups or family that the bedding accommodates. There was no salt or pepper anywhere. We left some McDonalds packets of salt and pepper for the next guest to enjoy. We found several light bulbs broken or not working and the small back yard area had high weeds growing. It would have been nice if they would have been cut so we could actually feel safe walking around the cabin. We enjoyed the pool table very much as my sons think they are better than I am .... not but it was hard for me to really show off as the cues and cue tips were in poor condition with no chalk available. A suggestion to the property manager would be to have nice paths from the cabins to the office (swimming pool) area to provide a shortcut that could be walked and enjoyed as a nature walk and to allow guest to swim. Who wants to pack up a vehicle and drive to the pool? Overall we enjoyed the cabin but for the price we paid we were disappointed in the attention to details of the home. We were very satisfied with this location and also the cabin. Would recommend to anyone . Thank you for taking the time to let us know about your stay in Amazing Majestic Oaks! We here at Cabins USA work hard to make sure each of our guests have the same great stay you enjoyed while vacationing in the Smokies. When you are ready to stay with us again, please mention you are a return guest for an additional discount. Thank you for choosing Cabins USA and we look forward to having you as our guest again! It was ok once we finally settled in. When we arrived the beds were not made and a cleaning crew was called in. They did a great job but after a long stressful afternoon about Magic Moments. The cleaning crew did not leave our cabin until after 10:30 that night. We do appreciate getting another cabin after all the confusion with Magic Moments and no tvs but our whole first day was not any fun for our family. We do need to say that Barry was very nice and did lead us to the new cabin, Magestic Oakes, and found beds had been slept in. He is an awesome employee representing Cabins USA. Our families enjoyed our stay at this cabin. We had a total of 6 adults, 1 teenager, and 1 small child. Everyone has plenty of room. The kitchen at times seemed a little cramped with a few of us trying to cook and clean up, but it all worked well. The table only seats 6 people. The location of the cabin was perfect, I think. We were far enough from the parkway to fell secluded from everything, but still close enough we could get anywhere we wanted within a few minutes. It was very peaceful. I also appreciated the express check-in and check-out process offered by Cabins USA. It was the easiest process I've ever had checking in and out of any thing ever. We really enjoyed our stay, and will definitely consider staying at this cabin again. The cabin has cobwebs in the corners next to the ceiling. There were light bulbs out all through the house. The cabin need some TLC and updates. Still over all we enjoyed our stay there and would use that one again. We had a great experience overall! I came with 9 other people and we felt that the accommodations were great to fit us all. The only issue with space was that the dining room table only fits about 6 people, so that was a bit of a downfall. Other than that, the porch, hot tub, deck, kitchen, and bedrooms were all up to par! We could have used a few more blankets on all of the beds as it was just a sheet and thin quilt, but it worked out okay. Furthermore, the pool table and checker supplies could be updated as the sticks are not in great condition and there are checkers missing. However, the pool table was nice overall and we enjoyed playing a few games! The kitchen was well-stocked with cooking supplies and the appliances were mostly in good condition. The main issue we had was that the sinks seemed a bit clogged the whole week and on the last night there the kitchen sink completely clogged and there was water draining back into the dishwasher as well. It looked like this had happened before as there were marks on the basement ceiling. Although this was unfortunate, we called the maintenance number and they responded very quickly and were very helpful! They also responded quickly when we had an issue with the hot tub breaker being turned off and showed up within about 30 minutes and fixed it promptly! We really appreciated the great service. The only staff complaint would be that the person who answered our phone call in regards to the hot tub was not very friendly. Other than that, the service was excellent and I would definitely recommend this place to anyone looking for a less expensive cabin for a large group that is off of the main road, but still feels secluded! Thank you for all of your kind words! Our maintenance department works hard to make sure each of our guests concerns are handled quickly. When you are ready to stay with us again, please mention you are a return guest for an additional discount. Thank you again for choosing Cabins USA and we look forward to having you as our guest again! Our family stayed an extended weekend in the Amazing Majestic Oaks cabin and it was Great, we will return to stay in the cabin again. The privacy of the cabin was great, it has bathrooms on each of the three floors. Kitchen well equipped with everything. I took extra bath towels because there was 12 of us and beach towels for the hot tub, other than that we had all that was needed a wonderful weekend. We are already looking to come back in the fall. Great Weekend!! Loved this cabin, it has 2 sets of bunk beds in the basement with the pool table. One bedroom on middle section, 1 bedroom as well as a loft bedroom upstairs. Each level has its own bathroom. The only problem was the dining table only had one bench (seats 3 people only) . I am so happy to hear that everyone enjoyed their stay in Amazing Majestic Oaks. When you are ready to stay with us again, please mention you are a return guest for an additional discount. Thank you for choosing Cabins USA and we look forward to having you as our guest again! Really enjoyed the cabin and the location. There were a lot of cobwebs in corners that need to be cleaned but was otherwise pretty clean. The sink in the bathroom on the main floor was stopped up and very slow running. My family and I enjoyed our time there and wanted to stay longer. Thank you for all of your kind words! We work hard to make sure that each of our guests have the same great experience you enjoyed while visiting the Smokies. When you are ready to stay with us again, let our reservationists know you are a return guest for an additional discount. Thank you again for your review and we look forward to seeing you again soon! This was a beautiful and spacious cabin! Only issue was the hot tub. It only stayed on for 15 mins tops then the display started flashin FLO. I looked it up and the filter needs cleaning. We will be back on our next vacation and hope to reserve this cabin again! Thank you for taking the time to let us know about your recent stay in Amazing Majestic Oaks and I am so happy to hear that everyone like the cabin so much! I apologize for the issue with the hot tub. Maintenance has been notified and will be working to correct that issue. When you are ready to stay with us again, please let our reservationists know you are a return guest for an additional discount. Thank you again for your review and we look forward to having you as our guest again! The Amazing Majestic Oaks was a perfect long spring break weekend for my husband and I and our closest friends. We were minutes from shopping and dining, but the cabin felt pretty private. We loved the grill and picnic area, the hot tub, and fire pit. It was so relaxing to sit in the rocking chairs and relax on the big wraparound porch. There was plenty of room for everyone to move about the cabin and it was well furnished with nice amenities such as the washer and dryer and pool table in the basement. We will definitely be coming back! Excellent cabin our church youth group enjoyed! Although the size of the cabin and its location were perfect for our needs, the cabin is very outdated and not very clean. The floors were absolutely dirty. Those of us who wore white socks found the bottoms of our socks nearly black. We also had a roach problem and had to call the office have an exterminater come to the cabin. We will use Cabins USA again. but will not stay in this cabin. The Majestic Oaks property we stayed at was very close to the strip and everything going on, but also just far enough away that we felt secluded and peaceful. The staff was very polite, and they even made some recommendations for local attractions. Pigeon Forge is so cool though! I don't think one can ever take it all in on just one visit. Also, extra for a pet friendly cabin, and it didn't have any odors or stains from previous guests. That was impressive to me, I will definitely use their services again and it would be cool if they emailed me with discounted stays during their slower months or something. Thank you for your review. We are delighted you had an exceptional stay with us at Amazing Majestic Oaks. We appreciate your business and the future business we will have together. We do offer return guest discounts, and as long as you sign up, we do have an option for our VIP e-mail list that does send promotions out annually. We look forward to seeing you again soon. It's a very nice cabin with plenty of room. There is no view of the mountains but it's a very quiet area despite being close to the parkway. Pool table and hot tub are nice for evenings and down times. The only issues we had were the bottom mattress on one of the hunk beds was too uncomfortable so my son around up sleeping on the trundle bed, and there was a lot of dust on the ceiling fans and higher areas. Thank you for your review. We are glad that you had good stay with us at Amazing Majestic Oaks. We apologize for any inconvenience, we will have the mattress inspected immediately. We hope to hear from you again soon. This is an older cabin with charm. Our family loves the Smokey Mountains and we have stayed all over the area. We will return to Cabins USA when we visit again. Upstairs shower door kept jamming and top shelf of dishwasher was about ready to fall, we as almost afraid to use it . other than that the property served our purpose. Thank you for your review. We apologize for any inconvenience you may have experienced during your stay with us. We have had our maintenance staff address the issues you addressed. We appreciate your feedback and we look forward to seeing you again soon. I was disappointed that the gas grill would not ignite. The twin bed mattresses were very uncomfortable. The ice maker in the refrigerator was also broken. The cabin would have been perfect except for these things. They may be small things but they are very important. We chose this cabin because it had so many individual beds and they were so uncomfortable. We called at 2:45 pm but were not allowed to check-in until 3:00 pm. We stood outside the cabin after traveling for 6 hours. At 3:00 we were finally "granted" the access code. It seemed a bit harsh and unnecessary to make us wait those 15 minutes! Really enjoyed the cabin other than the hot tub wouldn't bubble and the cabin had a foul oder when we would leave and come back in the next time we stay I will rent one that is not pet friendly. We all had a great time at Amazing Majestic Oaks. Everything was fine. We would consider this cabin again in the future. This was our first time ever renting a cabin. The cabin was perfect for what we needed. A family of 6 and 2 small dogs easily fit into this cabin with room to spare. The kids loved having the downstairs to themselves with the pool table. The cabin was clean, you are in the woods so of course they may be a bug or two but we had no major concerns. I had read a review about it "smelling" I didn't notice any smell besides the wood burnt smell from the fireplaces which added to the charm. I would say if you have small children (under 5) bring a baby gate for the lower level stairs they are pretty steep. We had a wonderful stay and we would definitely stay in Amazing Majestic Oaks again! Thank you! We had a wonderful experience and loved the cabin. It was perfect and just as described. It made our Christmas wonderful! It would have help if instructions of use for all electronic equipment had been available. We had to call the office and have someone out to show how to use the DVD and TV . Other than that we had a very pleasant stay. Very quiet and cozy. Thank you for staying with Cabins USA. We are so happy to see that you enjoyed your stay. We apologize for any inconvenience that you may have encountered during your stay. We do hope that you will stay with us again soon. Overall, the cabin was great. The roominess was very nice, hot tub was nice, but had to wait for it to get hot. The kitchen was nicely equipped, however, there was no salt, so we left a large container in the kitchen for the next people to use. There needs to be better dishwashing liquid as the one that was provided didn't clean at all. There needs to be more kitchen towels. The trundle bed had no sheets on them, and had to take sheets from other twin beds to put on them. The trundle bed was very unsafe--loosely put together and was questionable if it would hold an adult. They need more trash bags too. They could have provided much better body soap too--all the ones that we opened were extra tiny and broken into small pieces. If we ever go back, we will bring our own salt, dishwashing liquid, kitchen towels, and body soap, shampoos, toilet paper, and trash bags. We enjoyed the place enough to use it for two years, and hopefully again in the future. Thank you for choosing Cabins USA. We are delighted you had a wonderful and enjoyable experience with us at Amazing Majestic Oaks. We hope that you will keep us in mind for your future visits to our area.